The mother of a man stabbed to death in the street says her world has been "turned upside down". 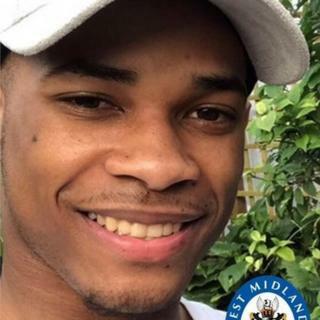 Leneto Kellengbeck, 24, died from multiple stab wounds in Arran Way in the Smith's Wood area of Solihull on Friday night, police said. His mother Jasmine described her son, a father of a two-year-old girl, as "kind and thoughtful". No-one has been arrested but detectives said CCTV checks were on-going and appealed for witnesses to contact them. Ms Kellengbeck said her son was callously taken from her and now all she had left were pictures to remind her of him. "The news of my son's demise came like a thief in the night," she said. "So sudden and unexpected, it gave me no chance to react or do anything in my powers to prevent it from happening. "Suddenly, my world has been turned upside down since my precious son became another victim of this dreaded knife crime." Det Insp Jim Colclough said: "We are still trying to establish exactly what happened, and need anyone who saw what happened, or who believes they might have information that could help us, to speak to us. "The smallest bit of information could help, so please do get in touch."